Final numbers for your meal (including any allergies) should be with your caterer by now. 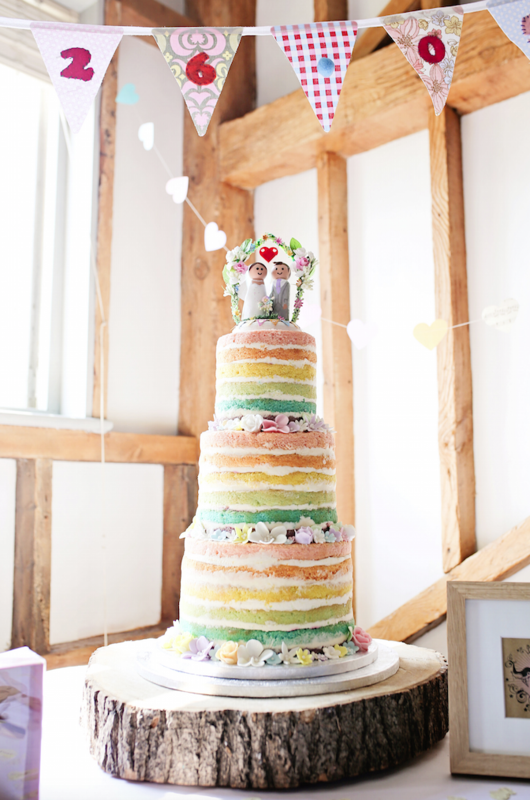 Your cake maker should know when and where to deliver your wedding cake and your florist will have all the bouquets and button hole numbers sorted. It’s worth a check with your photographer, wedding cars and DJ to make sure they know what is expected of them and the timings. Put a list together of all the main suppliers and give it to someone you trust on your wedding day. Then if anything happens (or doesn’t), you know who to contact. Now is the time to tell your bridal party of any last minute changes and what time they are needed. Also nominate someone to keep a list of suppliers for you on the wedding day (the best man might be best as he will have a pocket in his suit). Bridesmaids and flower girls and page boys will need to know if they are getting ready with you or meeting you at your venue. Ask someone to be in charge of a small emergency kit of plasters, tablets, tissues and mints. You might want to include needle and thread too just in case. Make sure your wedding party have tried on their outfits fully and there are no missing elements. If the best man and ushers are hiring suits, these should have been collected and tried on (making sure all accessories needed are there too). As the bride you will have had your final dress fitting and if you haven’t already, try your full outfit on. This is essential to make sure you feel comfortable and it all fits well, put shoes and jewellery on too to get the full look. Make sure you know how to do up your dress and that your shoes fit (it’s great to wear them around the house as much as possible). If you are having a veil then decide how you want to wear it so you can tell your hairdresser. Olivia by Timeless Chic is part of the High Low collection. This is our in-house exclusive collection of tea length wedding dresses that offer the bride to be the best of both worlds. Short at the front with a sweeping hem at the back which leads into a draping train. 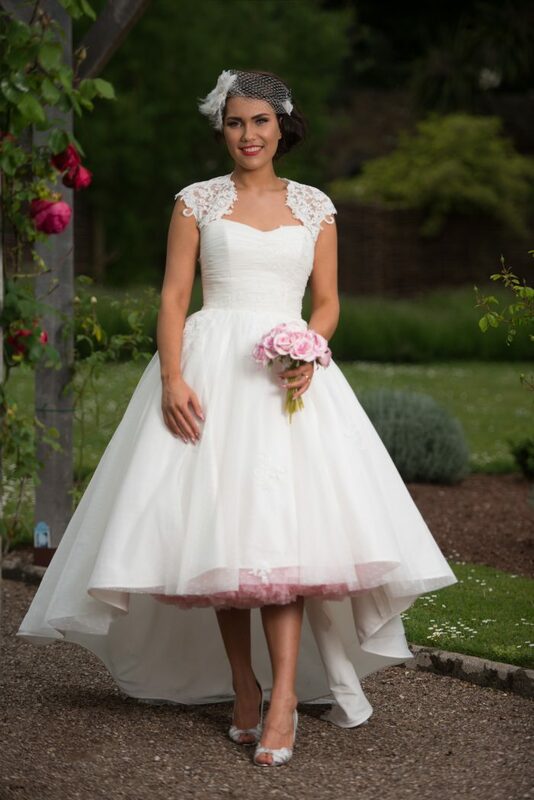 This is a very feminine retro wedding dress with a full skirt that shows your petticoats off in their full glory. If you are going soon after your wedding day then make sure you are packed and ready. This will eliminate any last minute panic after your wedding. Passports need to be in date and all insurance purchased. Think about the timings and travel plans, making sure you are all set and ready to go. With all the relevant information in one place. After your wedding day you’ll want to relax and enjoy being married so get these sorted beforehand. This might seem harder than it looks but try and relax as much as you can. Fit in some pamper sessions or a simple walk in the fresh air. Visualisation is a great way to calm your mind, think about what your wedding day will be like. With only one week until your wedding day, there isn’t much you can do by worrying or stressing. So eat well and drink lots of water and look after yourself so you feel your best on your wedding day. Remember you’ll be with the one you love and surrounded by family and friends so it will be wonderful. If you aren’t at this stage yet, we have a series of posts for every stage of wedding planning. If you need help finding your perfect short wedding dress, we would love to help. Come for a relaxed one to one appointment where we will find the best vintage style wedding dress for your day.